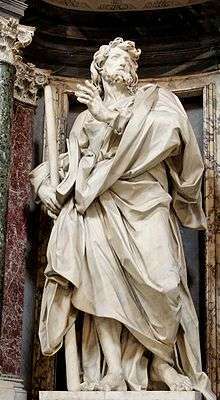 Statue of St. James the Less in the Archbasilica of St. John Lateran by Angelo de Rossi. In the New Testament, the name "James" identifies multiple men. James the Less is named only in connection with his mother "Mary" in Mark 15:40, who is also the mother of Joses (Joseph). "Mary the mother of James" is referred to in two other places, but he is not called "James the Less" there. This "Mary" may have been Mary of Clopas (alternately Cleophas), mentioned only in John 19:25. It is unlikely to be Mary the mother of Jesus since she is not identified as Jesus' mother but only called the mother of James the Less and Joses. The title, "the Less", is used to differentiate James from other people named James. Since it means that he is either the younger or shorter of two, he seems to be compared to one other James. In the lists of the twelve apostles in the synoptic Gospels, there are two apostles called James, who are differentiated there by their fathers: James, son of Zebedee, and James, son of Alphaeus. 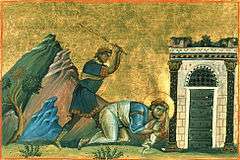 Long-standing tradition identifies James, the son of Alphaeus, as James the Less. James, son of Zebedee, is then called "James the Great", which is not a name found anywhere in the New Testament. Some propose that Alphaeus was the same man as Cleophas or at least the husband of Mary Clopas. “The only conclusion is that the Mary who is described as the mother of James the Less was the wife of Alphæus and sister of Mary the Lord's mother, the one who is called by John the Evangelist ‘Mary of Clopas‘. Mary, mother of James the Less and Joseph, wife of Alphaeus was the sister of Mary the mother of the Lord, whom John names of Cleophas, either from her father or from the family of the clan, or for some other reason. Therefore, James, son of Alphaeus would be the same as James the Less. Modern Biblical scholars are divided on whether this identification is correct. John Paul Meier finds it unlikely. Amongst evangelicals, the New Bible Dictionary supports the traditional identification, while Don Carson and Darrell Bock both regard the identification as possible, but not certain. Thus, Jerome concludes that James the Less is the same as James, son of Alphaeus and that James, son of Alphaeus is the same as James the brother of Jesus concluding that James the Less, James, son of Alphaeus and James the brother of Jesus are one and the same person. In Roman Catholic tradition, James's mother is none other than Mary Cleophas who was among the women at the foot of the Cross of Jesus, weeping. For that reason, and given the fact that the Semitic word for brother is also used for other close relatives, James son of Alpheus is often held as a cousin to Jesus. He is also thought by some to be the brother of Matthew the Apostle, since the father of both was named Alphaeus (compare Mark 2:14 and 3:18). ↑ "Saint-James. Apostle, son of Alphaeus". Encyclopaedia Britannica. Encyclopaedia Britannica, Inc.
↑ Jerome. "Fragment 15". The Perpetual Virginity of Blessed Mary. New advent. Retrieved 3 September 2015. ↑ of Hierapolis, Papias. Exposition of the Sayings of the Lord. Fragment X. earlychristianwritings.com. Retrieved 10 September 2015. ↑ John Paul Meier, A Marginal Jew volume 3, p. 201. "There are no grounds for identifying James of Alphaeus - as church tradition has done - with James the Less." ↑ saint, Jerome. De Viris Illustribus (On Illustrious Men) Chapter 2. newadvent.org. Retrieved 4 September 2015. 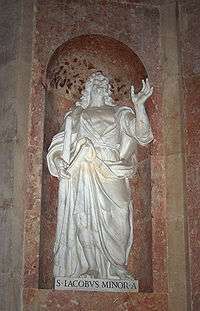 Wikimedia Commons has media related to Saint James the Less. The Search for the Twelve Apostles, William Steuart McBirnie, Ph. D. Tyndale Pp 183–194.